Thousands of people with diabetes will apply for life insurance this year. Not all of them will have a positive experience either. If you are looking into diabetic life insurance, being “in the know” will improve your chances of being approved at the lowest premium possible. How? Well, you first need to understand how life insurance companies handle applicants with diabetes in the first place. What do they look for? How can you prepare? What is the likely outcome? Before we answer those questions, let’s take a good look at diabetes. An estimated 23+ million Americans were diagnosed with diabetes. Another 5.5 million Americans or more are living with the disease and don’t even know it. 57 million have prediabetes, which means they are at risk of developing the condition. It is estimated that over 60 percent of those with diabetes will die of a heart attack or stroke. Diabetes Mellitus is the medical term for having diabetes. It is a type of metabolic disease that occurs when the pancreas does not produce sufficient insulin or the cells of the body do not respond properly to the insulin produced in their body. This results in high blood sugar in the affected individual. This type of diabetes is actually an autoimmune disease. Insulin must be injected into the body. This is caused by a resistance to insulin in which the body’s cells fail to use insulin correctly. As a result of this, the pancreas will gradually lose its ability to make insulin. Typically temporary condition that resolves itself after the pregnancy ends. The high glucose levels during pregnancy may cause the actual development of type 2 diabetes. How Does this Affect My Application for a Life Insurance Policy? When you apply for a traditional life insurance policy, you will have to take a free medical exam (administered in your home) unless you apply for a guaranteed or simplified issue (no medical exam) life insurance product which are more expensive. During any exam, you will be asked questions about your family history, medical history, lifestyle, driving record, smoking and alcohol usage. The nurse administering the exam at your home will measure your height, weight and check your pulse and blood pressure. Companies that offer diabetic life insurance are most concerned about their applicants taking the proper precautions to keep their diabetes under control. A documented history of regular medical checkups is very important to any insurance company. There are important measures you can take to prepare yourself before applying for any type of life insurance. Doing so will help your chances of getting approved at the best rating class possible. Use the next few tips to put yourself in the best position for coverage and refer to this article for our top tips to maximize your savings on coverage. Be sure to have all doctors’ name/address/phone numbers available. Do not skip any follow up visits with your doctor and handle all referrals. Premiums are generally lower for those who diet and exercise or keep their diabetes under control with medication. Your A1C level really does matter. Even a small improvement can be enough to earn a lower premium. Be sure to get a policy in force first at a premium rate you can afford. You can then focus on improving the rating class through better control or lab results. You can also add additional coverage later if you believe your financial situation has changed and need more life insurance. The good news about applying for any life insurance when you have diabetes is… yes, you can qualify!! Please understand that the approval and rating class can be variable. Life insurance for diabetics will require the use of a specialized, high risk life insurance agent/broker. Those quick life insurance quote widgets like on the right or those on another web site… the low rates you hear broadcast on the TV or radio are not going to be possible for you. Forget about those rates. The reality is, the majority of people do not qualify for those rates anyway. Call them teaser rates if you like. 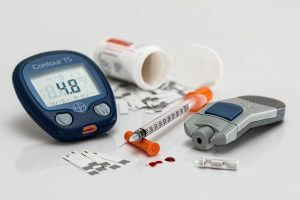 Diabetes is a very significant and special risk to any life insurer. You must understand that in exchange for taking additional risk, the premiums will increase to balance the scale. However, if you follow the advice we have provided on our website and more importantly, discussed your situation with your independent, specialist agent, the end result can be a positive one. Getting affordable coverage that you may have been told was impossible or too expensive is obtainable in many, many cases. If you would like more specifics on obtaining the best rates and outcome for your needs, you may check out our article on the top tips on obtaining the best rates available. We place trial cases with our special carriers that are most favorable to diabetics. We weed out the carriers that are not likely to be the answer to your problem. The goal is to obtain you the best rate possible with the product that best meets your goals. If you are not happy with the offers you receive, we can always try with another company. The other alternative is to put a policy in force and work on improving your rating class through better diet and exercise to improve the your lab results and reapply for a lower rate later. That of course would be your decision, but an option so you can get coverage in force sooner than later. We hope this article has answered some of your questions about obtaining life insurance with diabetes. Let us know if you need any assistance. Feel free to call, email. We’re here to help.